climate both inside the shower and outside it, in the “dry” zone. Glass doors are a stylish completion of your shower. If your shower cabin is already built from traditional materials and you just have to equip one side, which naturally which will serve as an entrance, we suggest installing glass doors into this opening. Doors made out of glass for a shower undoubtedly became one of the most important aspects in modern bathroom design. Such a door looks much more attractive than traditional protective curtains in waterproof cloth. Glass shower doors are durable, elegant and a great addition to the bathroom of any style. 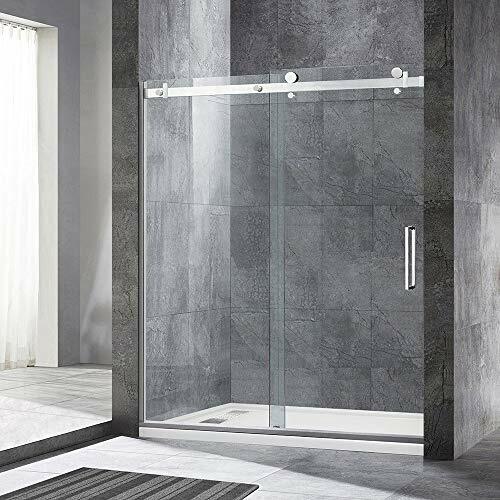 Buying an all-glass shower door is a good investment in a luxurious interior and the functionality of your bathroom that will stand the test of time. Shower glass doors may have different types of opening: swing, sliding and folding types. You should pay a special attention to sliding doors that have a unique advantage of opening both inwards and outwards. Thus, the water flows into the shower space and the floor remains dry, which guarantees you complete safety. Glass is unpretentious material. You can easily remove any dirt from its surface - all you need is an alcohol-free glass cleaner. Difficulties may occur only with old stains, but this will not happen if you practice the daily cleaning after each use of the shower. strength exceeds plastic doors. And the biggest advantage is individual choice of dimensions and design.